Google may have announced two Pixel smartphones alongside Google Home and an updated Chromecast along with ‘Google Wifi’ router, but it also announced some new software along the way. 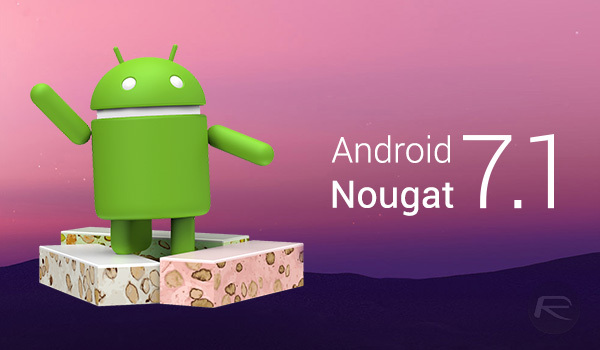 Android 7.1 Nougat is an updated version of the operating system that will first come running out-of-the-box on the newly announced Pixel and Pixel XL smartphones that go on sale in about two weeks from now. It will of course come to other Android devices too, including Nexus devices sometime in late 2016. So while Android 7.1 will come to other devices in due course, and will not be a Pixel-exclusive release as a whole, but that doesn’t mean that everyone will get to use all of its new features. 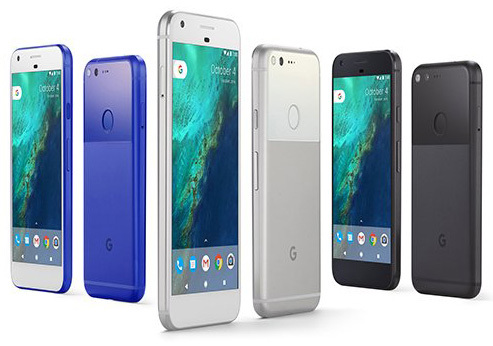 In fact, and disappointingly for non-Pixel Android users, some of the biggest new features of Android 7.1, such as Google Assistant and the all new Launcher, will remain exclusive to Google’s own Pixel smartphone lineup. Google hasn’t been overly forthcoming about what officially will and will not breach the Pixel borders and make its way into Nexus and other Android phones moving forward, but a source at Google has apparently leaked the complete changelog for Android 7.1, including a split of what is only going to be made available officially on the new Pixel phones, and what will be available to Android devices from other manufacturers, including Nexus devices. Though it’s as yet unclear whether the Pixel C tablet is going to fall into the same pool as its smartphone counterparts. 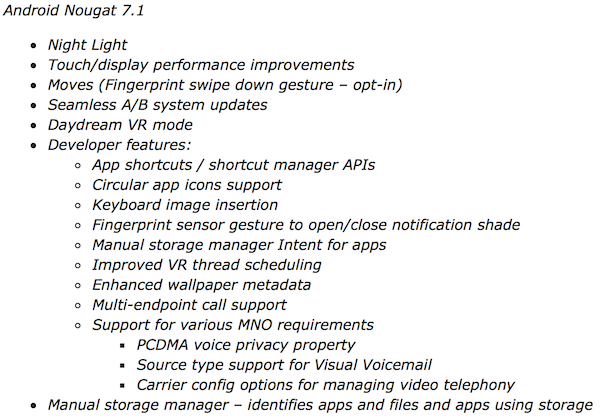 The changelog of Android 7.1 for both Pixel and non-Pixel devices is a lengthy one, so bear with us. So there we have it. 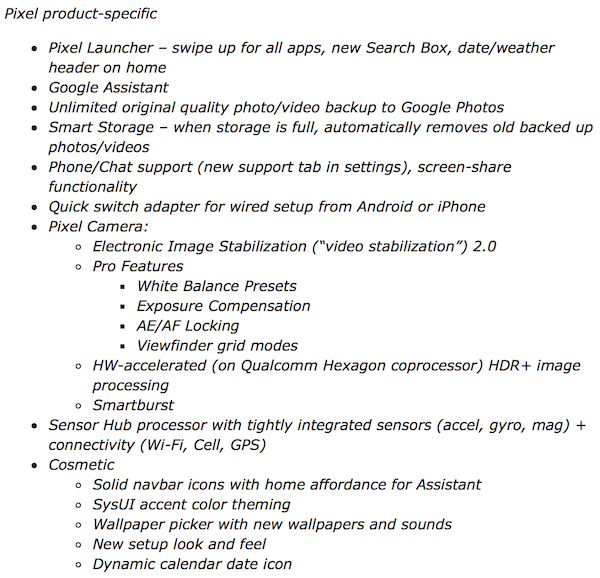 As can be seen in the changelog above, the Pixel Launcher will unfortunately not be making the move to the Google Play Store as the Google Now Launcher did, which is a shame, but the biggest miss here is Google Assistant, which too won’t be available on non-Pixel Android phones. Things like circular app icons, Night Light and Daydream VR mode though will be available to other Android devices if OEM manufacturer decides to support them. Now we’re just left wondering which devices they will be. Over to you, OEMs. This is a huge middle finger to the android community. On october 4th, I lost all respect for google. Pixel Launcher is eh. Used it and didn’t really like it. Better launchers out there, the Pixel can keep it. Google created the OS but Samsung put it on the map. Otherwise android would be another irrelevant OS like windows mobile. The problem is Google promoting fragmentation, instead of doing something about it. In any case, with a price of €1010 (around US$1150) in Germany for the Pixel XL 128, I could buy TWO OnePlus 3 for €399 each AND still have €212 ($240) in my pocket. Wow! And I thought it was just apple that just gave you tiny worthless updates. At least they have the decency to call it a .01 update. Minor update top priority is to address issues (security issues, performance issues, bug, etc). Major update should be the one with many change. For apple case, they tend to give you more but tell you less about the change. For example, from iOS 9 to 10, there is hundreds change, but apple only tell parts of it. If Samsung can put Android OS on the map, why they can’t put their own Tizen OS on the map yet? In fact, Tizen OS is more irrelevant than Windows Mobile. It’s because people buy Samsung phone with Android OS inside. I agree Samsung make a remarkable phone, but no one want to buy S7 with Tizen OS inside. Got my point? Actually Samsung was making a lot of the world’s phones way before android came out with their own os…so I don’t see where you have a point. True, Samsung make a lot of the world’s phones before Android and it’s a good hardware, but do Samsung really matter that time? Got the same fame as now? No, because Nokia with Symbian OS is the king of smartphone in that era. It’s collective effort of many brand that put Android in his place now. Don’t undermine another brand effort and claim it all for Samsung. Need proof? See smartphone market share, Android have the largest market share, dig down and see, how many % is from Samsung? Those “tiny worthless updates” are the most important because they fix security issues as soon as they are discovered unlike Google. You’re pretty stupid. Android is already the most fragmented OS in history…lol Now Google is going to start making Android for it’s own devices and one for everyone else… too funny. What Apple have and Google lack is total control in both software (OS) and hardware. By total control of hardware & software, you can have tight integration, better performance, etc. In other hand, Android need to stay loose to maintain its compability. It need to support different range of hardware, from low end to high end. You can buy 2 different Android phones and have a slightly different experience / taste.